Since finishing my master’s, I can allocate more time to reading and sharing my ideas and responding to contemporary literature. 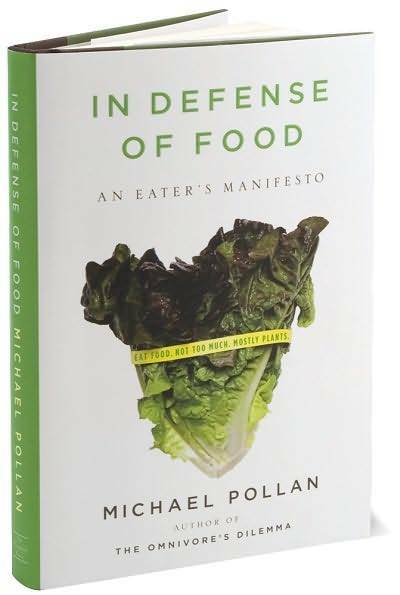 One recent read is Michael Pollan’s In Defense of Food: an Eater’s Manifesto. First things first, the only disappointment while reading this book is the ending. I literally mean that I was disappointed that it was over and contemplated reading it again. To be honest, I’m still thinking about a reread before I return to the library. That’s only after I make Danny Boy read it. This book does an amazing job gathering the information for an understanding of the industrialized food system we are immersed in and the effects it is having. Nobody would argue that the state of food and nutrition is horrible. Obesity and childhood obesity is becoming more commonplace and the millions of ways to fix obesity and nutrition-related diseases are not finding the right solution. When I trace back in my life and examine my relationship with food, I imagine that it is similar to many other people’s experiences in American Culture. Food while I was growing up was fast, convenient, often made in a microwave, or came straight from the freezer. Sometimes people are amazed to hear I never tried broccoli, green beans, spinach, eggplant, and even a long list of fruits until my early 20’s. But I wonder, why is that surprising? I grew up in the suburbs, near farms, but rarely was my food fresh and made from scratch unless it was a baked potato. I have recollections of feeling fat as early as 6th and 7th grade and can remember asking my mom how I can diet and eat healthy like her. But it was too much of a bother to teach me to eat healthy and she told me to go on walks and just burn off the calories I eat. By the time I started going to college, I was searching for ways to improve my health and weight. I tried going vegetarian, and the results were a lot of cheese pizza and pasta. Hardly the variety of fruits and veggies that my body needs to be nourished. I also tried those “healthy” lean cuisines that you pop into the microwave and chow down. They had smaller portions but I never knew that the overly-processed meal lost most of its nutrients from being processed. At the very least, I can say that I am proud to have changed a lot of those issues within my own life. I have learned to distrust the Low Fat claims on packages that a business thought would make me purchase the item. I’ve began to add whole foods and cook my meals from scratch. But although I was understanding where I needed to go, Michael Pollan really gave me the knowledge to explain why in so many ways. The number one thing I will take away from this book is that I can control my relationship to food and food culture. I can become one of those people shops at the farmer’s market (which I did last summer) but explain why it is so good to eat locally grown foods. In Defense of Food finally explained to me why the past attempts at low fat or low calorie diets did not work. It explained that all those food experts I had been reading about and listening to did not really have the answer. Nutritionism and scientists search for the one key ingredient that does this or that. Eating whole veggies and fruits provide a group of nutrients needed by the body. Another thing I learned is that we spend less money than other industrialized nations on our food and more money on healthcare. I learned that the best fruits and veggies are picked locally and at the peak of ripeness. That buying apples from New Zealand are picked early and allowed to ripen on an airplane. I learned that meat and eggs are bad quality if the animals are corn-feed instead of grass. I learned that I can lessen my carbon footprint by eating local foods because fuel is not wasted to move it to my grocery store. The biggest most important lesson of all: every time I purchase something, I am sending a message to the manufacturers about what I want. We often blame the supermarket and fast food places for providing unhealthy (but often times convenient and tasty foods). Anytime you go to the store and purchase the cheap meat that was feed unnatural diets and antibiotics, you are telling the world that you don’t care about your health and to continue producing the food at this standard. When you purchase a processed food that has chemicals and words you cannot pronounce, you are telling the company to continue to make it that way. When you go to a farmer’s market and buy whole veggies and fruits, you are giving money directly to the farms without being processed, adding flavors, or sodium to prolong shelf life. Another eye opener in this book is that our culture and society is full of malnourished people. Obesity and malnourished? How is that possible? You’d think that obesity and more weight means more food and nutrients. But when our diets are strictly processed foods, we don’t get the right numbers of nutrients, and when most of your food is made from mostly corn and soy, you aren’t getting the diverse veggies and nutrients your body wants. The fact that we have immediate access to all types of fruits and vegetables but the drive-thru at McDonalds is always crowded is upsetting to me. Thirty years ago when processed foods started replacing whole foods, people didn’t know what they were doing to our culture, health, and bodies. Now that we are finding out the truth, it’s really time to change that. The only reason processed and unhealthy food is so cheap is because it is in high demand. So stop putting the demand and your dollars into the unhealthy and undernourishment of our bodies. End rant! Back to the purpose of this post, Pollan’s book really made all of the above ideas clear. His ideas and facts are well researched and supported. As a journalist, Pollan really did a great job gathering and presenting a lot of perspectives. This book can transform your perspective about our food culture and really make sense out of the confused and contradicting nutrition advice. If you have struggled for a long time to eat healthy or get real answers about food, then I highly recommend you read this book. This book covers all the angles, scientific, cultural, ecological, and was well worth every word. Thank you for reading my blog! Please feel free to share your opinion after you’ve read it! I’d love to hear what you think!